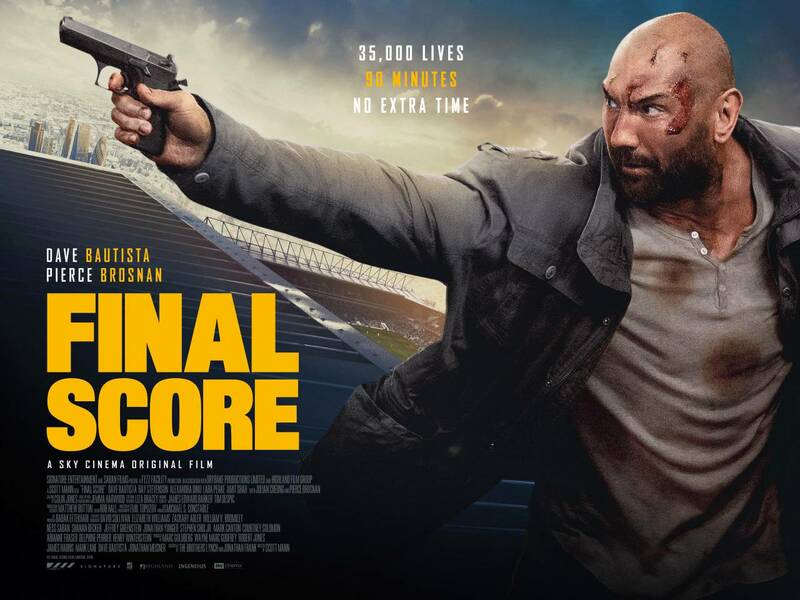 On September 7th 2018 the Boleyn Ground enters the limelight once again – but this time with a major role in action film Final Score, starring Dave Bautista, Pierce Brosnan, and Ray Stevenson. It’s supposed to be a fun evening out for ‘Uncle’ Mike and his teenage niece Danni when they attend West Ham’s European Cup game against Dynamo FC – but it all changes when terrorists abduct Danni and take an entire football ground hostage under constant threat of death. It falls to ex-soldier and lethal fighter Mike to raise the alarm, save his niece, and stop the Boleyn from going up in deadly flames. It’s an action-packed thrill ride that will delight fans of gratuitous violence – but be warned, it packs a massive sucker-punch to those missing the ancestral home of West Ham United. Some of the scenes of our old turnstiles, seats, stairs, bars, views will completely knock the air out of your lungs. It’s hard to see them alive and preserved on film when you can’t quite reach out and touch them. Part of the convincing mirage is that the atmosphere in the film is incredibly true to form, and sets the scene for a relatable opening – the air is alive with a night game match build up and it sets the scene well for the energetic and lively film that follows. There are moments that get to you emotionally, but then the West Ham faithful won’t be able to avoid groaning at some inconsistency errors. Mike and Danni enter the stands through the staircase next to my old seat in the “Alpari” Upper; but sit down in the Lower section. The crowd is dismayed and irate when mobile signal is cut off; we all know the only time anyone has ever gotten signal at Upton Park was when we were down 0-3 (0-9 on aggregate) to City in the league cup and half the ground had already left, freeing up just enough bandwidth for the other half to complain on Twitter. Just when it’s starting to feel a little surreal, West Ham’s opponents score and the Hammers are 1-0 down. Now it feels more realistic. Apart from the ground nostalgia, there’s a lot to like about this film. The plot is strong, the (heroic) characters are endearing and there’s a lot to be said for the physical strength of women (both good and evil) in the film. It’s an adrenaline-driven film and the action kicks in with immediate effect. The film does well to drive a convincing backstory in a very quick manner, and as the match kicks off, so does the action. The acting is good, too. Dave Bautista as American war hero Mike is tough and endearing; a good mix of strength and vulnerability, and you’re rooting for him to win. Lara Peake’s Danni, an angsty teenager, is well-portrayed, and the comic relief provided by Amit Khan’s really rather funny Faisal Khan, whose big heroics are a clever and all too accurate dig towards current prejudices alive and well across the UK, is really well-done. Also, wonderfully, ex-James Bond Pierce Brosnan is somehow in this film. There are, of course, some elements which need the imagination to be stretched. The fans are cut off from the outside world and have no idea of the danger they are in, yet remain largely oblivious to the helicopter firing semi-automatic rounds into the roof of the Bobby Moore stand, the motorcycle gun fight in the “Alpari” Upper concourse, and a bloodied man with stab wounds fighting off a multitude of police officers and then invading the pitch. Of all my drunken moments in the Boleyn, I’m still convinced that no matter how many pints I’d have downed, If a motorcycle based shootout had happened on the main concourse, I probably would have mentioned it to my mates on my return to my seat – and had Noble been on the pitch, he’d have dealt with that invader, stab wounds and all. The violence is intense, and it’s certainly not for the faint of heart – but for an action movie, it does what it says on the tin and more. There is excellent use made of the roofs of the stadium for the dramatic physical scenes in the movie. The fight scenes are brutal but well executed – and unlike at West Ham’s current ground, there’s a lot of shooting going on – possibly even to a West Ham legend, but jury and cast list are still out on that one. So does Mike save the day? Does the Boleyn go up in smoke? Do West Ham manage to come back from a goal down to win a European semi-final cup game? You’ll just have to watch it and find out. The West Ham Way were offered free tickets to a screening of this film – but we’d have liked it anyway.